What Makes Swim Spa Swimming Different? Posted on May 19, 2017 June 12, 2017 , in Swim Spas. Most of us know that swimming is one of the best types of exercise, but using a swim spa can provide you with benefits that swimming laps simply can’t. Below you’ll learn why swim spa swimming offers a superior workout and how you can use yours to get in exceptional shape. Whether you’re a young athlete in training or a senior who wants to maintain your cardiovascular health, using a swim spa allows you to customize your experience so it’s perfect for you. If you have issues with mobility or joint pain, using a swim spa is a great way to get a low-impact workout. Likewise, if you have a sports injury that prevents you from doing your normal dry land routine, a swim spa can be a great substitute while you heal. A swim spa also offers a wide variety of additional exercise options including free weights, resistance band training, and rowing so you can change up your routine to stay motivated. No matter what part of your body you want to strengthen and tone, a swim spa is a great way to do it. Unlike most forms of exercise, swimming uses your entire body, strengthening your arms, legs, back, glutes, shoulders, and more. In addition to strengthening, swimming in a swim spa provides outstanding cardiovascular benefits, making your heart and lungs stronger. Finally, using a swim spa increases your blood circulation which can alleviate pain and stiffness. Studies show that swimming can reduce stress. Whether you run, walk, or swim, the sounds of the water and the soothing experience of being immersed in it can reduce anxiety and alleviate stress. To further enhance the stress benefits, use the heated massage area to get a massage that is customized for you. This area is a major difference between swim spas and swimming pools, so you’ll want to take advantage of it. When you want a better workout than you can get in a swimming pool, a swim spa is the perfect choice. 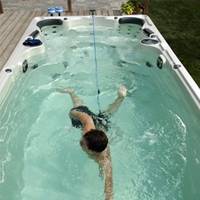 Swim spas can be fitted with additional fitness options including water treadmills, resistance training options, weight lifting, rowing, and more. Some even come with custom flooring that makes running and walking more effective. If you’re an athlete, swim spas are ideal training partners because they have the ability to monitor your time, speed, distance, heart rate, calories, and more. They also give you options for speed and resistance adjustment so you can challenge yourself as you improve. The overall experience of swimming in a swim spa is also different because you swim in the center of the lane and cannot rest on the walls. This unique continuous swimming will help you burn more calories and give you a better cardiovascular workout than swimming in a pool. Now that you have a good understanding of what makes a swim spa a superior fitness choice, download our buyer’s guide and look at our many fitness-focused swim spa models.